Dat van Kubica is meer een soort stunt? Hij is bijna 10 jaar uit de F1 geweest en stuurde in zijn laatste jaren al veel met 1 hand omdat hij er last van had. Hoe fit is zo'n man dan om nog coureur te zijn? Er is toch een overvloed aan jong talent wat plaats kan nemen in het stoeltje? 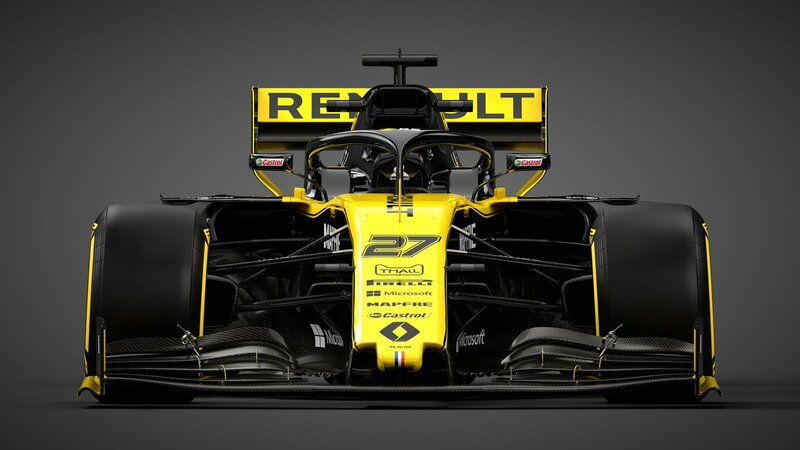 Zou Kubica veel geld meenemen, en zo ja, waar vandaan.. Veel vragen..
Los van het rollen van Hulkenberg niet zo'n spannende race. Max die blijkbaar weinig van twee weken terug had geleerd als je zag hoe hij Ocon voorbij ging Voor de rest wel netjes hoe hij nog die derde plek te pakken heeft gekregen. Last edited by Rappa; 26th November 2018 at 13:04. Ik vond het wel een vermakelijke race. In het middenveld gebeurde er genoeg. Max nog vierde in het kampioenschap. Die heeft echt een inhaalslag gemaakt. De volgende post hier onder plaatsen aub. Waarschijnlijk dacht hij: "wat jij kan, kan ik ook!" In eerste instantie werd hij toch gelijk weer ingehaald door Ocon? Maar later ging hij hem wel heel netjes voorbij. Vond het ook knap dat hij alsnog als derde eindigde, maar wat was Bottas allemaal aan het doen zeg!? Mooi ook dat Alonso tot driver of the day verkozen werd. 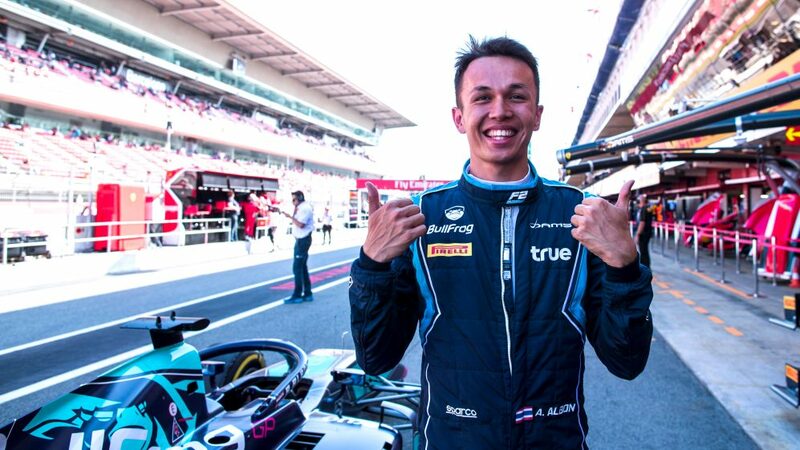 Albon, who will partner Daniil Kvyat and replaces Brendon Hartley, joins after an impressive season in F2, which saw him go into the season-ending Abu Dhabi weekend as one of only two drivers who could have claimed the title, although he ultimately lost out to George Russell. The London-born Thai driver, 22, had one sole season with the Red Bull Junior Programme in 2012, and looked set to race in Formula E next season, but has now been confirmed as an F1 driver, and will be the first Thai on the grid since Prince Bira in 1955. He said: “It’s such an amazing feeling to know that I’m in Formula 1 next year. Throughout my single-seater career, I went through a few ups and downs. I was dropped by Red Bull in 2012, so from then I knew my road to Formula 1 was going to be a lot harder. “I worked really hard and tried to impress every time I got in the car, and I have to say a big thank you to Red Bull and Dr Marko for believing in me and giving me a second chance. Franz Tost, Toro Rosso Team Principal, added: “Alexander had an impressive Formula 2 season in 2018. He won four races and finished the championship third. Albon is the third 2018 Formula 2 driver to make the climb up to F1 next year, following in footsteps of McLaren-bound Lando Norris and Williams-bound Russell. Lance Stroll is widely expected to race for Force India in 2019, his father having led the consortium which took over the team earlier this year, and he will test for them in Abu Dhabi this week. Ik hoop dat er nog een deel 2 komt. Genoeg vermakelijk materiaal. Leclerc zal vast een snelle rijder zijn, maar dat Franse accent.... aaargh. 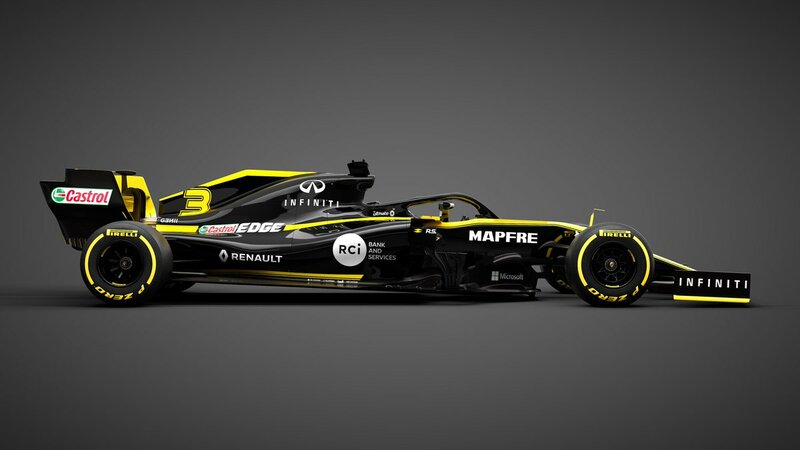 They unveiled the fresh look – the first black-and-gold colour scheme since Lotus’ 2015 challenger - at a launch event at the Royal Automobile Club in London on Thursday, with 2019 drivers Romain Grosjean and Kevin Magnussen both present. Haas chose a combination of red, grey and black in their first three seasons in F1, but for the new campaign, the team’s livery will incorporate the black and gold colours of their new energy drinks partner Rich Energy. Haas Team Principal Guenther Steiner said: “It’s important that we keep progressing as a team, and this season is no different. Our partnership with Rich Energy is another positive example of moving forward as an organization. 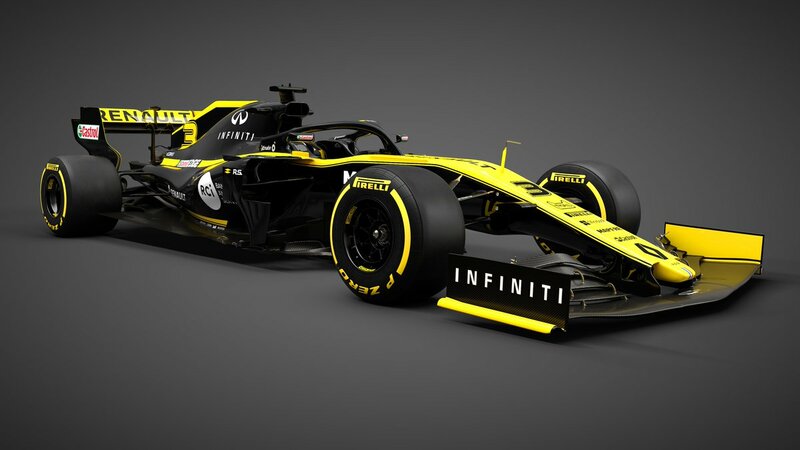 "We’re pleased to see their colors on the VF-19, we welcome them as they join our valued partner group in utilizing Formula One as a global marketing platform. While 2018 delivered our best season to-date, the year showed, sometimes sharply, that we still have areas to improve on as a team. The American team, who were formed in 2016, will be hoping to enjoy a season of success in their new colours, having made progress last season. After debuting in F1 with two eighth-place finishes in the constructors’ championship, Haas stepped up their game last season and emerged as the fourth-best team on pure pace. A series of mistakes meant they failed to convert that advantage, but they still ended up fifth overall – an improvement of three places. Last edited by Rappa; 7th February 2019 at 12:38. Vond de Haas liveries altijd de saaiste van het veld. Dit ziet er iig een beetje classy uit. Doet me denken aan de John Player Special Lotus livery van vroegah! Twitch van Lando Norris, die samen met o.a. Max Verstappen voor Team Redline de 12h van Bathurst rijden. Cool, die ga ik even opzetten. Filmpje van Jimmie Broadbent tegen Norris en Verstappen ook gezien? 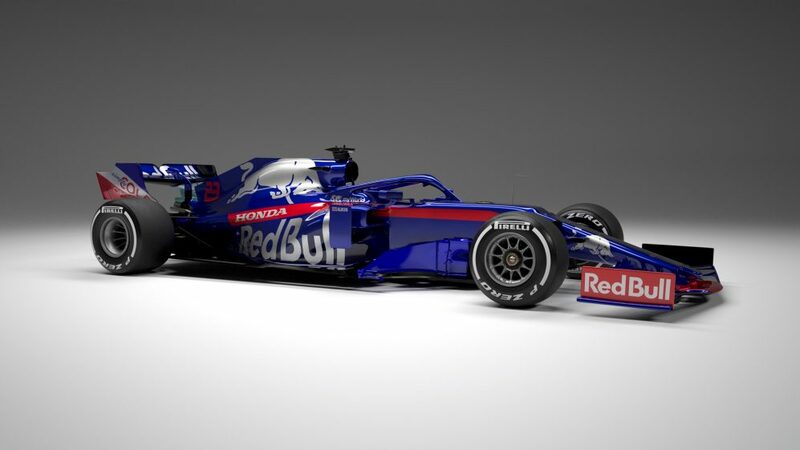 Toro Rosso have become the second Formula 1 team to show off their 2019 challenger, after revealing the STR14 that will be driven by Alexander Albon and Daniil Kvyat this season. 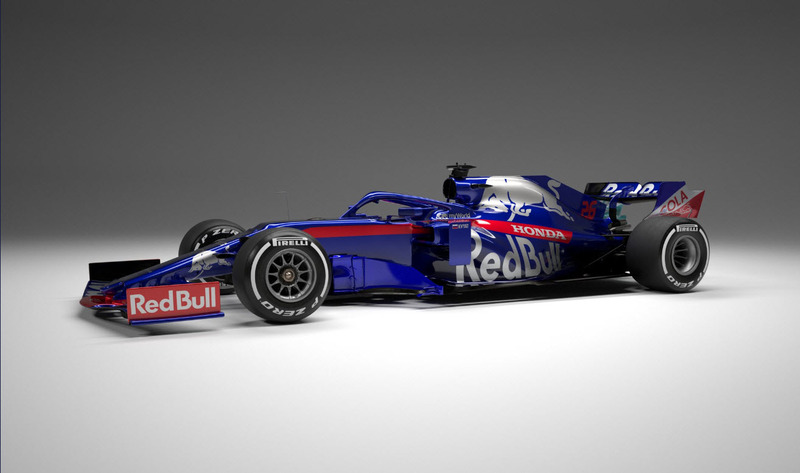 The car is an important one for the team, following the announcement that Toro Rosso and Red Bull would increase their technical cooperation for 2019. 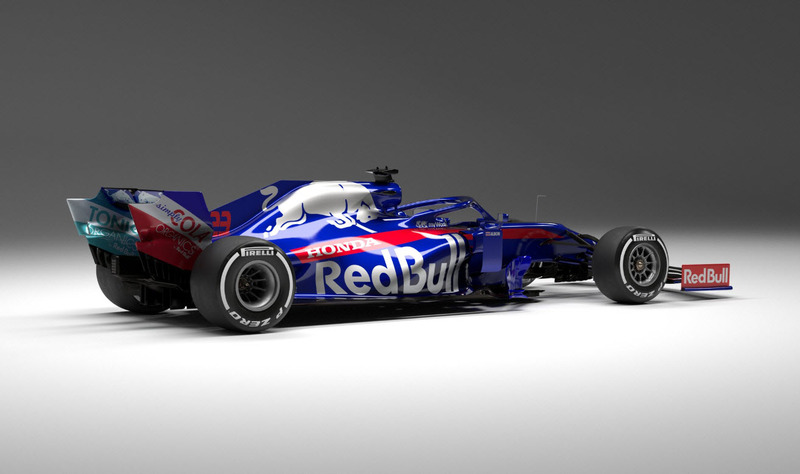 That will see the two squads’ cars share an entire rear end – which includes the Honda power unit that Red Bull will switch to in 2019, plus the gearbox, rear suspension, and electronic and hydraulic components – as well as some front suspension parts. In principle, that should help the team build on a solid 2018, which saw them finish ninth in the constructors’ standings after a season punctuated be several punchy performances, most notably Pierre Gasly’s fourth place at the Bahrain Grand Prix. Driver line-up-wise, meanwhile, it’s all change for Toro Rosso – and both Daniil Kvyat and Alexander Albon will doubtless be pleasantly surprised to find themselves in the positions they’re in currently, given that Kvyat lost his drive with Toro Rosso before the end of the 2017 season, while F1 debutant Albon was dropped from Red Bull’s Junior Team programme all the way back in 2012. Both drivers will get their first taste of what the STR14 is like on track when winter testing begins at Barcelona on February 18. Those ‘strong young drivers’ for 2019 will be Daniil Kvyat and Alexander Albon – and both will doubtless be pleasantly surprised to find themselves in the positions they’re in currently, given that Kvyat lost his drive with Toro Rosso before the end of the 2017 season, while Alexander Albon was dropped from Red Bull’s junior programme all the way back in 2012. “We don’t know exactly where we’re going to be,” said Kvyat. “Like everyone else, we are working hard to put the best package together and the best thing I can do for myself is to work as hard as possible on myself and on my performance. Both Kvyat and Albon will get their first taste of what the STR14 is like on track when winter testing begins at Barcelona on February 18. Last edited by Rappa; 11th February 2019 at 15:05. Voor de meeste zullen de termen wel duidelijk zijn maar ik kon erg lachen om de "Not to be confused with"
A new F1 season means a new set of fans ready to immerse themselves in the technicolour, sensory overload-y glory that is Formula 1 (we’re biased, we know). But with F1 being the technical, jargon-laden sport that it is, it can sometimes be hard for a newbie to work out what the hell the drivers, team bosses and commentators are talking about half the time. So to help new fans get themselves up to speed, we decided to produce a guide to some of the most commonly used pieces of F1 slang, and what they mean – and here it is! What is it: When a driver, struggling to get past another car, pits early in a bid to get a performance advantage from fresh tyres that will hopefully put them ahead when their rival then pits. Not to be confused with: A haircut popular with hipsters the world over. What are they: Small pieces of rubber that are shredded from the tyres during cornering, which build up off the racing line. Running onto them mid-race can be treacherous as they prevent the tyre making proper contact with the road, thereby reducing grip. Driving over them after the chequered flag, however, is a nifty tactic the drivers use to try and make sure their cars aren’t underweight at the race end. Not to be confused with: Lots of small glass balls on the track. That would be dangerous. What is it: ‘Dirty air’ is created by the odd vortices of air spinning off the back of a leading car and reducing the efficient airflow over the wings of the following one, giving it a performance disadvantage by reducing downforce. Clean air is when a car is out on its own, with a nice, undisturbed airflow passing over its wings, providing good downforce. Not to be confused with: A gastric problem. What is it: Quite simply, it’s when the underside of the car hits the track. It’s usually caused by bumps in the track or a sudden rise or crest, à la Eau Rouge. The act of bottoming was made more spectacular, if you’ll pardon the expression, by the introduction of titanium skid blocks in 2015, which throw off a shower of sparks when the cars’ undersides hit the deck. Not to be confused with: Anything involving the gluteus maximus. What is it: Blistering is when the temperature imbalance between a tyre’s hot carcass (the inner bit) and cold surface (the outer bit) cause pieces of rubber to explode out of the tyre, leaving a hole. Graining is when the tyre’s carcass is cold and surface is hot, with the resulting flex in the tyre causing the rubber to chunk off and stick to the surface of the tyre, reducing grip. Not to be confused with: Something that requires a verruca sock in the case of blistering, or something to do with trees in the case of graining. What is it: When a driver’s talent manages to overcome the limitations of a car that is far from the class of the field. Fernando Alonso has been a prime example over much of the last decade, but other famous ones include Ayrton Senna’s performance for Toleman at Monaco in 1984 and Sebastian Vettel’s win for Toro Rosso at Monza in 2008. Not to be confused with: Running faster than an F1 car. That doesn’t work. What is it: Those drivers circulating at the back of the F1 field, who are often liable to be lapped by the leading cars. Not to be confused with: A lower back tattoo. What is it: The driver who claims pole position during qualifying for the race. Not to be confused with: A form of medieval torture involving sharpened sticks. What is it: Heard more often a few years ago when tyre compounds tended to degrade rapidly, ‘falling off the cliff’ was the moment where the tyres’ performance dropped sharply away during a race, rendering them uncompetitive. Not to be confused with: Anything to do with lemmings. What is it: When the driver locks his front brakes, causing one or both front tyres to stop rotating, meaning they slide longitudinally along the track as opposed to rolling along it, planing a flat surface onto the tyre. Not to be confused with: An unsightly facial blemish. What is it: If a driver is looking like they’re burning too much fuel to get to the end of a race, their engineer might tell them to ‘lift and coast’, meaning that the driver lifts off the throttle and cruises into a braking zone, which uses less fuel – although it obviously slows down their pace. Not to be confused with: An elevator at the beach. What is it: When a driver mashes the brake pedal, all four brakes act to slow the car down – but the driver can shift how effective the front brakes are compared to the rears by changing the brake bias. In the wet, a driver will usually shift the brake bias more to the rear to stop the front brakes from locking, while drivers will also change the brake bias throughout a race as the balance of the car changes thanks to factors like lower fuel levels and tyre wear. Not to be confused with: The driver preferring Brembo brakes over AP. What is it: Partly because of the problems caused by ‘dirty air’ (see above), in 2011, the drag reduction system was introduced into F1. Basically, it’s a flap that, when lifted, reduces the drag acting on the car, allowing it to travel faster and aid overtaking. This can only be used at certain points on the track, known as DRS zones, and only when a car has been detected as being less than one second behind the car in front. Not to be confused with: Cricket’s Decision Review System, used to check an umpire’s decision. This is decidedly not cricket! What is it: Time was when Formula 1 cars just had engines. No longer! Now they have ‘power units’, which comprise the following six elements: the Internal Combustion Engine (ICE), the Turbo Charger (TC), the Motor Generator Unit – Heat (MGU-H), the Motor Generator Unit – Kinetic (MGU-K), the Energy Store (ES) and the Control Electronics (CE). All of these elements combine to give the current crop of F1 drivers a smidgen less than 1,000bhp to play with. Not to be confused with: Watts. What is it: When barked as an instruction to a driver over the radio, it means that they need to pit. Used as a noun, it refers to the drivers’ servicing area in the pit lane. Box comes from the German Boxenstopp, meaning pit stop. Not to be confused with: An instruction to punch someone in the head. What is it: Drivers usually face a ‘green track’ when they first head out for Friday practice during a Grand Prix weekend. It essentially means a circuit that hasn’t had much rubber laid down onto it yet, and is therefore not providing optimum grip in the dry. Not to be confused with: Some weird Mario Kart venue. What is it: A sideways moment for a driver where the back end of the car steps out. Not to be confused with: Someone who does peaceful protests. What is it: During cornering, oversteer is when the rear wheels of a car lose grip, causing the back end to step out. Understeer, on the other hand, is when the front wheels lose grip, which sees the car travel at a shallower angle than the one the driver is asking for with the steering wheel until the front tyres grip up again. Or to paraphrase the great rally driver Walter Rohrl, if you see the barrier you’ve driven into, that’s understeer. If you hear yourself hitting the barrier, it’s oversteer. Not to be confused with: Alternative approaches to riding a bull. Rokit nieuwe sponsor van Williams. Wtf, nog nooit van gehoord, ze hebben niet eens een Wiki en het enige wat ik kan vinden is een of ander ongerelateerd kledingmerk. 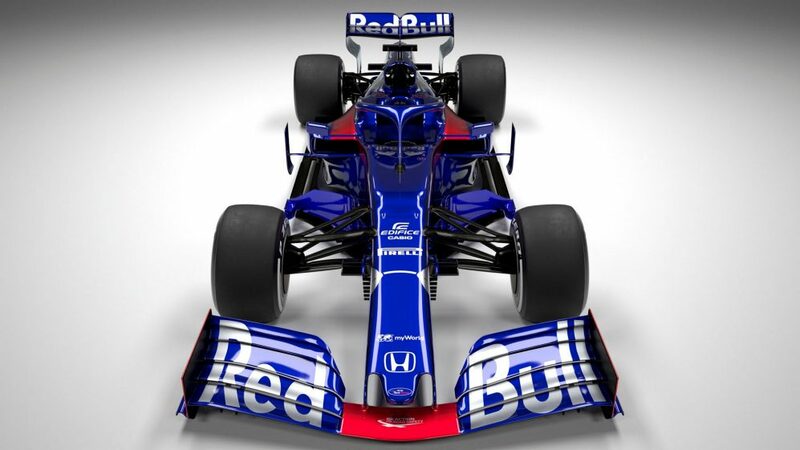 Verder afschuwelijke livery, net als die Haas. Torro Rosso saai, maar wel interessante auto. Ja, daarom juist. Echt weer zo'n faal-actie van Williams. Nog nooit een telefoon op de markt gebracht maar wel 'hoofdsponsor' van een F1 team? De lat ligt dan erg laag lijkt me. Wat maakt dat nou uit, geld is geld lijkt mij. Vraag maar aan Force India wat dat uitmaakt Geld moeten ze wel echt hebben. Ik begrijp dat ze ook een NBA team sponsoren, maar dat het binnenkort gelauncht wordt. Ben het verder met je eens dat het niet echt een barre sponsor is, maar ik denk dat op dit moment voor Williams geldt; beggars can't be choosers. En laten we eerlijk zijn, Rich Energy daar hangt ook een hele dikke schaduw over heen, want heb jij al eens een blikje kunnen kopen? En laten we eerlijk zijn, Rich Energy daar hangt ook een hele dikke schaduw over heen, want heb jij al eens een blikje kunnen kopen? Inderdaad, ik heb onwijs lopen googlen erop, maar verder dan een paar fake amazon reviews kom ik niet. Rich Energy wilde vorig jaar zelfs Force India overkopen... Waar komt dat geld vandaan joh! Ik meen zelfs te hebben gelezen dat de naam 'Rich Energy' mogelijk dispuut wordt in een rechtzaak. Er schijnen meerdere vennoten te zijn geweest die het niet eens konden worden over de naam / logo. Die voorvleugels worden gesponsord door Gilette? Ben er ook (nog?) geen fan van! Geef toe, die halo ziet er ook niet meer zo verkeerd uit na een jaartje. Heb wel het gevoel dat het class A en class B veld in tact is gebleven nu ik die Mercedes en Red Bull zie. Als een totale leek: Waaraan zie je dit? Als het idee was om auto's cleaner te laten lijken.... wat een chaos zo rond die sidepods. De RB loopt wel lekker smal af naar achteren. Dat Honda-blok lijkt maar weinig ruimte te gebruiken, zo op het oog. 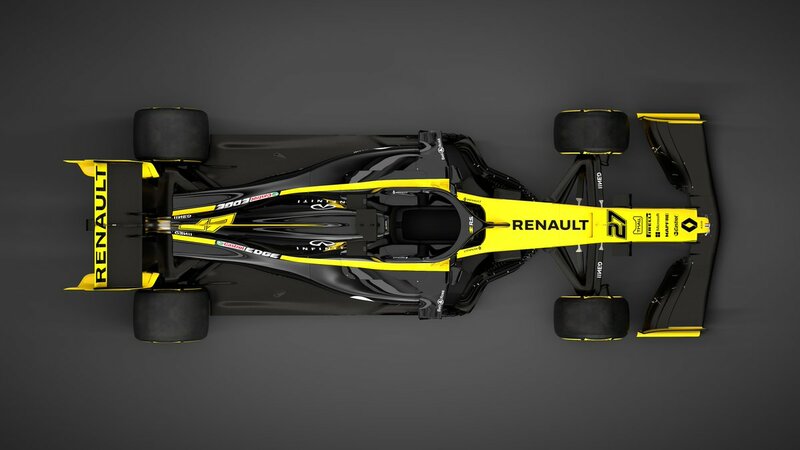 De Renaults / Ferrari & MB hebben toch meer body naar achteren toe. Puur visueel gezien kan je vrij goed zien dat de Mercedes en Red Bull veel verder doorontwikkeld zijn dan de Haas, Renault, Williams en Toerisme (serieus autocorrect?) Rosso. Neem mijn woorden overigens niet voor waarheid aan hoor, maar dat is puur het gevoel dat ik heb als ik de auto's naast elkaar zet.